I always use the best quality materials, which are locally sourced when available. 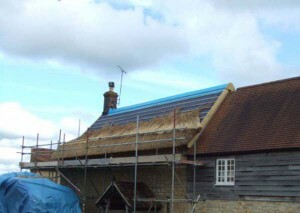 An average roof can take approximately 2 months to complete and depending upon the materials used, can last upto 40 years. This maybe called Wheat Reed, Combed Wheat Reed or Wheat Straw and provides a more rounded appearance than Water Reed. Combed Wheat Straw has been used as thatching material for decades and was initially the by product from grain production. In more recent years, with increasing demand it has become a specialist product, only produced by those with the old fashioned machines. This material has a lifespan of between 25-30 years and is the most popular material for ridging. A Combed Wheat Straw ridge requires galvanized netting to cover and protect it from rodents and bird damage. This maybe known as Norfolk Reed or Continental Water Reed, they are generally straighter and less rounded looking that Wheat Straw, however it can be applied to look like Wheat Reed, with a softer and rounder appearance. It is very hard wearing and has a lifespan of between 30-40 years. 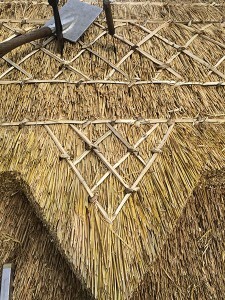 New properties are thatched in this material as it gives the most cost effective roof to customers. 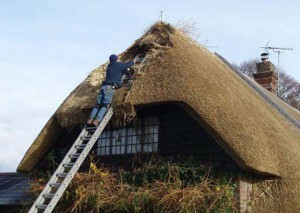 Spars are the traditional fixings used to hold down the layers of straw or reed. They are split lengths of hazel and are pointed at both ends, twisted and used as a prolonged peg to hold the thatch. They are also used to hold down the ridge and are laid in a decorative pattern. The spar makers I use source their materials locally and provide a very high quality product.